So a couple of days ago I get a little package from Meredith publishing. I say to myself, "Self, what do you suppose this is?" I open it up and inside is a copy of BHG's latest issue of 100 decorating ideas under $100 with a card that says "This issue comes to you with our compliments...The Editors." I think to myself, "Self, hmmmmm, I wonder..."
I exclaimed to myself, "Self, this is so exciting!!! More magazine-love for my little mudroom!" Congrats on the magazine feature! How exciting, and you totally deserve it! Fun stuff! Super cute idea and practical too - my favortie combination! Congratulations, Wendy! That's awesome. :) It really is a great project! It's so functional and cute! Congratulations! That is so fantastic! Enjoy your celebrity! Congrats!!! This is so awesome!! And I have to say that the Spongebob Episode that you referred to is my MOST FAVORITE OF ALL TIME.. It's too funny. *sponge* + *starfish* = *scallop*? Congrats! I was flipping through that magazine the other day and saw your mudroom in it. Congratulations....you are a Celebrity AND a Genius! Great job on the mudroom creation. Yay for you!!! You always have amazing ideas and the mudroom was no exception. Can't wait to pick up my own copy soon. Looking forward to see what all you do for staging. Wendy Congratulations!!! How exciting! I too would be giddy and so happy to see something I did in BHG~my dream! I too have proably let my kids watch too much Sponge Bob...I have many episodes memorized...and it doesn't help that I too have watched some. The most funny to me "Bubble Buddy"! LOL! Have a great day and enjoy your stardom you deserve it!!! That is my favorite SPONGEBOB episode ever!! Yay! You should definitely be a proud stage mom!! :) You deserve it! Congrats on the magazine article! That is so exciting and very well deserved! I love spongebob - how sad is that statement. Congrats on the magazine entry!! Oh, I love that magazine! That is so cool! What a clever idea! And it looks so finished, like that is just what the space was made for! ha ha, I have every sponge bob episode memorized too. But I actually like the show. I don't love watching the same episode the 50th time like my kids do, but they are always humorous the first time around. You're a rock start. That is so awesome!!! Congratulations, Wendy! What an honor! Definitely worthy of two pulications! I have all the SpongeBob episodes memorized, too. My husband loves him just as much as my 8 year old. They even have matching SpongeBob jammies. I guess boys will be boys! I'm a brand new blogger (also with 4 kids) and I'm so glad I 'stumbled upon' you. Congratulations on your 'little mudroom that could'! My mom doesn't own a computer and just can't seem to grasp the concept of a blog, but she gets that magazine (she's an antiques dealer). I can't wait to share it with her. Very exciting! I'm so happy for you! It is a great project!! Congrats on the spotlight! Your mini-mudroom is so cool. I need one in my house. so awesome! you are famous!!!!! Ooh! Those "100 Ideas" mags are so addictive. I am going to have to stop myself from picking them up! Love it that you/ your rehabed closet....that I love is in this...can't wait to pick it up! Congrats! How impressive. 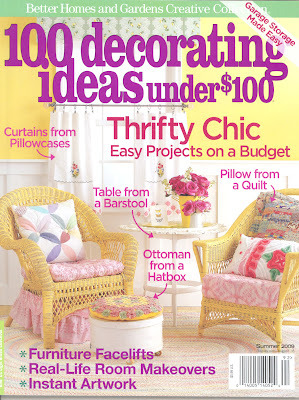 I love this magazine and I can't wait to grab a copy and see your mini mud room featured. Congratulations! That is so cool. I will have to pick-up a copy and look you up. Wow, congratulations :)!!! Such a great project, it's been a favorite of mine! What a thrill to be published :)! Yay!!!! Congratulations! How have I not seen that before! Brilliant!! Thank you, thank you, thank you for this mini mudroom idea. I have been wanting to do the same thing with a closet next to my front door, but I wasn't quite sure how it would look. Now I know! It looks darling and I am going to start tomorrow!!! Congratulations! Very nice! I am sure I have been that idea in their magazine before and now I know where it came from. Wow! What a terrific idea. I'm definitely tucking this away in my inspiration file. Fabulous! Congrats! How exciting is that! I remember seeing it in the mag! Whatta wonderful idea/solution!